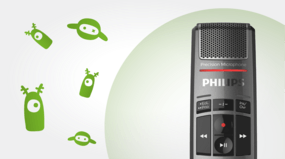 The Philips SpeechMike Premium Slide Switch – SMP3710 is THE microphone for outstanding performance with Dragon Medical Practice Edition 4 with the familiarity of Slide Switch operation of a digital recorder. This microphone provides quality noise canceling input with the slide switch (microphone on/off) operation you love. When implementing Dragon Medical Practice Edition consider getting a microphone for each workstation to avoid moving the microphone from exam room to exam room. The Philips SpeechMike Premium Mic with slider switch sets a new standard in voice recording, making it a perfect companion for SayIt for Healthcare, Dragon Medical One, and Dragon Medical Practice and all of its functionality. This very popular mic among medical professionals delivers a level of clarity and accuracy. This version of the Philips SpeechMike Premium features slide-switch operation for easy control of Record, Stop, Play, Fast and Rewind functions. It’s especially good at cancelling background noise and reducing any vibrations that may occur as you move about your office, clinic or hospital. Outstanding ergonomic advances give this mic high accuracy in speech-to-text operations. On top of that, Philips surrounds the mic in a smooth, polished housing designed to reduce unwanted touch noises. Order today for fast shipping! Place your order now and get the sound and clarity you need for all your transcription needs.